Contents About the contributors. 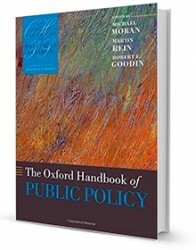 ix -- The public and its policies / Robert E, Goodin, Martin Rein & Michael Moran. 3 -- institutional and historical background. 39 -- The historical roots of the field / Peter De Leon. 39 -- Emergence of school of public policy: reflections by a founding dean / Granham Allison. 58 -- Training for policy makers / Yehezkel Dror. 80 -- Modes of policy analysis. 107 -- Producing public policy. 205 -- Instruments of policy. 407 -- Constraints on public policy. 527 -- Policy intervention: styles and rationales 605 -- Commending and evaluating public policies. 687 -- Public policy, old and new. 831 -- Index. 913.